The hooded sweatshirts have drawstrings around the neck area that pose a strangulation or an entanglement hazard to young children. No injuries have been reported. Academy Sports + Outdoors stores and online at academy.com from August 2012 through October 2013 for about $28. 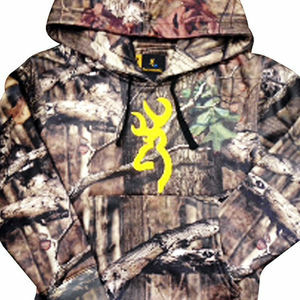 Immediately remove the drawstrings from the hooded sweatshirts to eliminate the hazard or return the garment to Browning for a full refund. For more information, contact the company by phone at (800) 727-4312, by email at browninghoodie@browning.com, or go online to browning.com and click on Recall at the top of the page. Browning at (800) 727-4312 from 8 a.m. to 4:30 p.m. MT Monday through Friday, online at www.browning.com and click on Recall at the top of the page, or email at browninghoodie@browning.com for more information.